Upon hearing that Platoon were back in town, it was clear a launch night to celebrate their ten years on the scene was going to be a corker. And they did not disappoint. With a line up boasting some of the best local talent as well as a headline set from the drum and bass don that is Nicky Blackmarket, the night was set to be one to take everyone on a trip down memory lane. Local drum and bass DJ Nothing to Lose set the scene for the night, playing some of his favourite dubs from his label Grand Theft Audio Recordings. Landa and Alex Da Kidd brought an element of fun behind the decks, playing some classic tunes by Chase & Status and DJ Hype amongst others. The crowd were definitely feeling the party vibe by the time Logan Sama kicked off his set with some tasty grime and dubstep mashups as well as some dubplates – tracks like Flux Pavilion’s Bass Cannon, Chase & Status’ Eastern Jam all with some excellent MCing which had the crowd skanking for the whole hour he was behind the decks. Nicky Blackmarket’s set was epic, as you’d expect from a DJ of his calibre. Having played so many nights up and down the country and across the world, he knows exactly how to get the crowd going, and following on from some excellent talent, he did not disappoint. It’s fair to say I didn’t stop moving the entire time he was on – and I don’t think anybody stopped to sit down whilst he was on the decks! It takes a night of certain quality to get such a talented DJ down, and it says a lot about Platoon that Nicky Blackmarket was their first headliner. Local lads North Base rounded off the night with their excellent selection of tracks and a mixing style that had netted them a summer’s worth of festivals across Europe. If you haven’t managed to catch these guys in Manchester just yet, get on it – you’ll find them at most nights, providing a tasty mix of music all the way from 110bpm up to 174. For a launch night, the crowd was on the small side but really enthusiastic and having spoken to a few of them, they were definitely veterans to the drum and bass scene. As such, the atmosphere in the club was great – no funny business, just people out who enjoy the music, enjoy the scene and other people’s company. One of the highlights of the night had to be how involved with the crowd the guys from Platoon were – every time a huge tune dropped, the Platoon lads were on the floor with the rest of us, proving that they are really fans of the scene and not just out to do this because it’s cool. Club IXIV was the perfect venue for their launch night – intimate but with a banging sound system. The DJs weren’t tucked up far away behind a massive wall – the club set up puts the DJs right down with the punters, which leant itself excellently to the crowd that had come down. As with all good things, they must come to an end, and I was genuinely gutted at the end of the night when it was time for the club to empty and for everyone to go home. This launch night was a great comeback for Platoon – great music, great crowd, great vibes – I can only hope their next night will as successful! 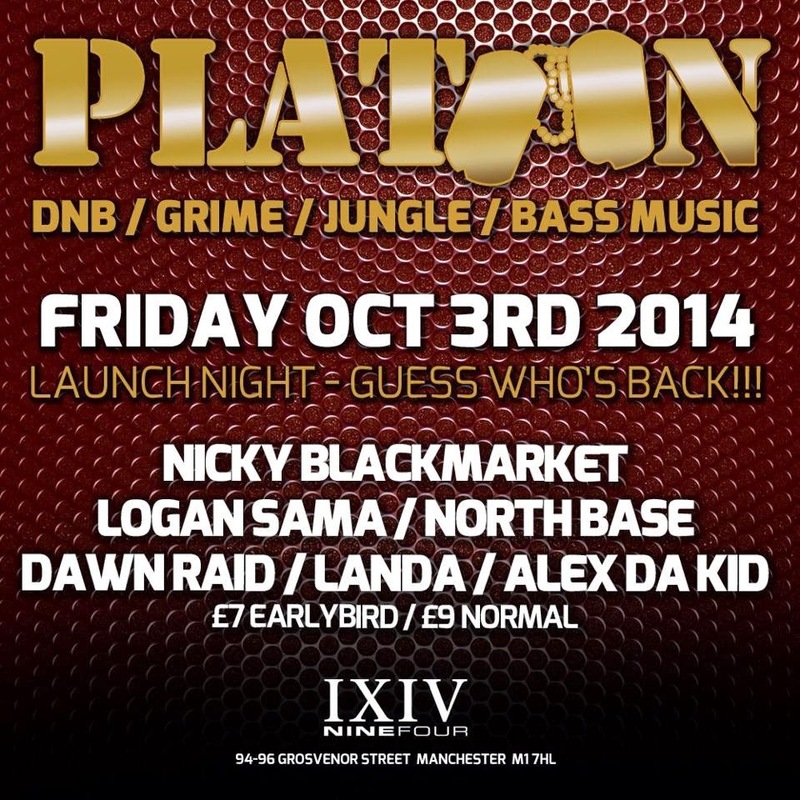 Platoon’s next night is on Friday 7th November and headlining this event is Mampi Swift, doing a 2 hour ‘History of Drum & Bass’ set with Manchester’s very own Tonn Piper. Local talent is also provided from Rowney & Propz, Toddlah, Chimpo and Mark XTC so it’s definitely a night to get down to. Whether you’re a newcomer to the d‘n’b scene or a well-seasoned veteran putting on their skanking shoes, Platoon is sure to provide you the right kind of atmosphere and a great selection of DJs at a great price. Judging by this launch night, the best is yet to come from the Platoon guys, and I can’t wait to see what else they’ve got up their sleeves.